A Radiation Sterilization Validation determines the appropriate radiation sterilization dose for a product that requires a sterile label claim. It incorporates bioburden testing, a bioburden recovery efficiency test, a sublethal radiation dose (verification dose), a test of sterility, and bacteriostasis/fungistasis testing. If a sterile label claim is required and the sterilization method will be radiation, a validation is required to determine the appropriate sterilization dose. Nelson Labs has vast experience providing validations for complex or unique products, or products which cannot handle large doses of radiation. The testing complies with the radiation sterilization standard ANSI/AAMI/ISO 11137 and technical specification ANSI/AAMI/ISO 13004. A Radiation Sterilization Validation is used to determine the appropriate sterilization dose for a product. Usually the sterilization dose must represent a sterility assurance level (SAL) of 10-6, which is a one in 1 million probability of a nonsterile product. The most common validation methods are VDmax (Verification Dose Maximum) and Method 1. 1. Bioburden test: This test determines the quantity of viable microorganisms on or in the product. This test is performed prior to any sterilization but after all other manufacturing steps, including packaging. Critical to this test is the performance of a recovery efficiency test to determine the effectiveness of the bioburden extraction method at removing microorganisms from the product. Other options for performing bioburden are available and may be more appropriate for certain product types. 2. Application of verification dose: The bioburden results are taken to a table from the standard to determine the proper verification dose. The verification dose is then applied to the required number of products. Samples should be double bagged prior to dosing. This provides an extra barrier to take into the cleanroom and can reduce the potential for false positives. 3. 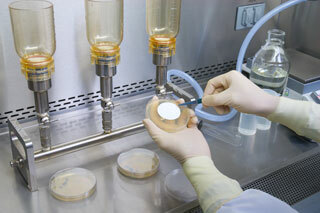 Sterility test: The irradiated products undergo a test of sterility. The acceptance criteria for each method are detailed in ANSI/AAMI/ISO 11137-2. Critical to this test is the performance of a bacteriostasis/fungistasis test to demonstrate the lack of inhibition in the sterility test system, which is required to validate the test of sterility. If the number of nonsterile samples in the test of sterility meets the acceptance criteria, the radiation sterilization dose is validated. Additional testing should be performed on a quarterly basis (called a quarterly dose audit) to demonstrate that the sterilization dose continues to be appropriate for the product. The quarterly dose audits follow the same flow as described above, but only involve samples from a single batch, and include use of the verification dose determined in the validation rather than setting a new one. A less frequently used validation method is Method 2 (available as either Method 2A or 2B). This method is used when it is critical to validate the lowest sterilization dose possible for a product, usually because the product is sensitive to radiation. Options for reducing the number of incremental doses required for a Method 2 can be found in AAMI TIR40. Requirements of radiation validations and quarterly dose audits are provided in the ANSI/AAMI/ISO 11137 standard series. If you have additional questions about Radiation Sterilization Validation testing, or would like to consult with the experts at Nelson Labs, just send us a request or call us at +1 (801) 290-7500.